Universal mini tripod stand for any selfie stick with 1/4″ threaded hole at the bottom to stand alone as a tripod. Tripod stand enables you to record photo and video for hours with minimum effort. It bring you a relaxed shooting environment. Quick-release tripod mount adapter easily attach your GoPro camera to a standard tripod or bracket. Strong and durable design, made to withstand heavy repeated use in a variety of environments. If for any reason you are unhappy with any product by Smatree®, please do not hesitate to contact Kumu-UK Customer Service with your order ID. We take full ownership and responsibility for the quality of our products and will do our very best to solve your problem quickly and efficiently! Smatree® is a registered trademark protected by US Trademark Law. Smatree® products are sold by authorized sellers only. Kumu-UK is the sole agent of Smatree on Amazon. 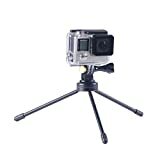 This entry was posted in Discount Photography and tagged 5/4/3+/3/2/1/Session, Adapter+Thumbscrew, GoPro, Hero, Mount, Smatree, Stand+Tripod, Tripod by Ball Photo. Bookmark the permalink.